If you haven't heard yet we're growing. Yes, the little brewery that could is gaining two new tanks. 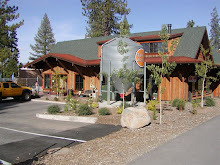 To better serve the greater Tahoe area we needed a little bit more capacity. Rather than going the typical route we engaged a more local stainless steel fabricator over in Mound House, NV. Mound House is due east of Carson City on Hwy 50. Mound House is famous for it's 'ranches' that have something to do with bunnies. We expect these tanks soon as the third week in October.